Akim Toussaint (right) of Trinidad and Tobago chases after a ball while Argentina captain Joaquin Gonzalez looks on during last evening's final of the Indoor Pan Am Hockey Cup. PHOTO COURTESY PAN AM HOCKEY FEDERATION. TRINIDAD AND Tobago men’s hockey team booked their tickets to the 2018 Indoor Hockey World Cup in Berlin, Germany after thrashing Argentina 7-0 in last evening’s final of the 2017 Indoor Pan American Hockey Cup, at the Cliff Anderson Sports Hall, Georgetown, Guyana. The win capped off a superb week for the TT outfit, as they won all six of their matches at the Indoor Pan Am Cup – five in the round-robin phase and yesterday’s decider. Mickell Pierre got the ball rolling with a third minute goal, while Akim Toussaint made it 2-0 for TT in the 11th. Pierre netted his second, on the stroke of half-time, to give the twin-island republic a three-goal cushion. Solomon Eccles notched TT’s fourth in the 23rd while Marcus James got his name on the scoresheet five minutes later. Toussaint scored his second goal in the 34th and the rout was complete when Aidan de Gannes struck the backboard in the 36th. 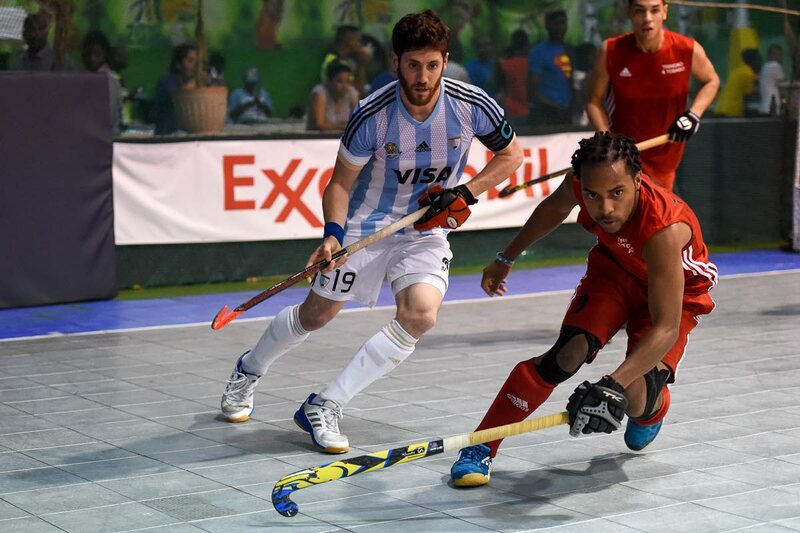 Only the winners of the respective men’s and women’s finals were entitled to places at the Indoor Hockey World Cup and TT ensured that their opening day 5-2 victory over the Argentines were not a fluke. Canada defeated hosts Guyana 5-2 in the bronze medal match while Barbados overcame Mexico 6-4 in the fifth-placed match. In the women’s category, TT whipped Guyana 3-1 in the fifth-placed contest. Alanna Lewis (10th), Arielle Williams (23rd) and Blair Wynne (39th) were on target for TT, while Marzana Fiedtkou replied for the Guyanese. The United States edged Argentina 2-1 in the women’s decider, while Uruguay squeezed past Canada 3-2 in the bronze medal fixture. Reply to "TT book tickets to Indoor World Cup"